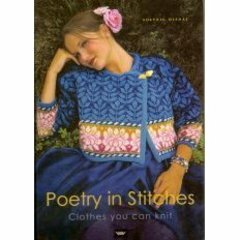 I received a question yesterday on Ravelry asking how I knit the pattern on the cuff of my “Poetry Cardigan”, the Brocade Leaves Cardigan, which is the cover photo, from the book Poetry in Stitches. The paperback version of this book is still available here, and I would highly recommend purchasing it. This is a book that is not only beautiful, but a great inspiration. It should be on the library shelf of every knitter who is interested, or thinks that they might ever be, in Fair Isle knitting. In my opinion, that should really include all knitters. It is not as hard as you think (okay, perhaps these patterns are not for beginners), and so rewarding to see the pattern evolve. At times, I can’t put my knitting down when an intricate pattern is involved, as each row gives me another peak into the final design. The question on the cuff was how to balance the large flower pattern on the cuff. There is enough room for 2 full and a partial flower, and the pattern increases as the cuff widens. The directions call for centering a flower on the front and adding partial flowers to the left and right. This works very well, and by the time the flower pattern is finished you have increased enough to have almost 3 full flowers. 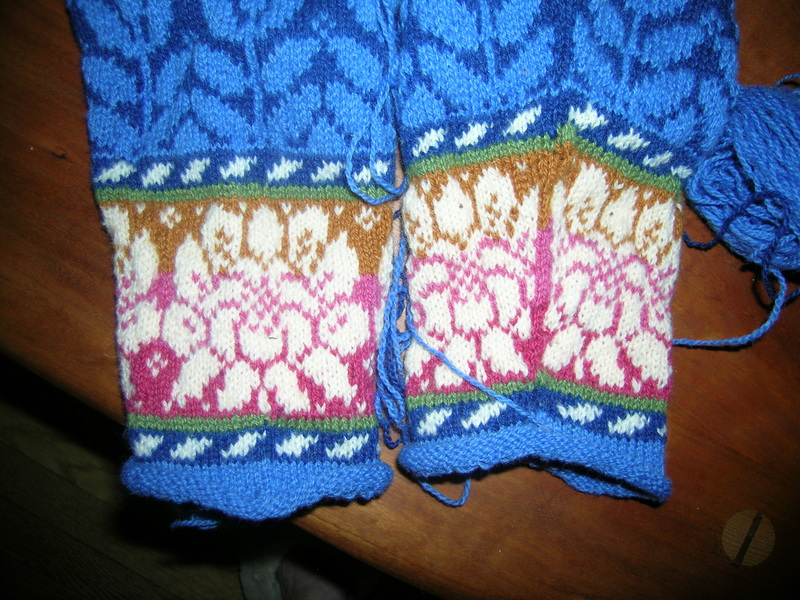 The change that I made here, and tend to do on most of my Fair Isle sleeves, is to knit the first and last stitch in each round in the background color. This allows for easy increases that are in pattern, and you do not see the jog in the knitting that is apparent when you try to carry the fair isle around each and every stitch. To me, it gives a nice “seam” effect to the sleeve. I have done it the other way, and would not repeat that. 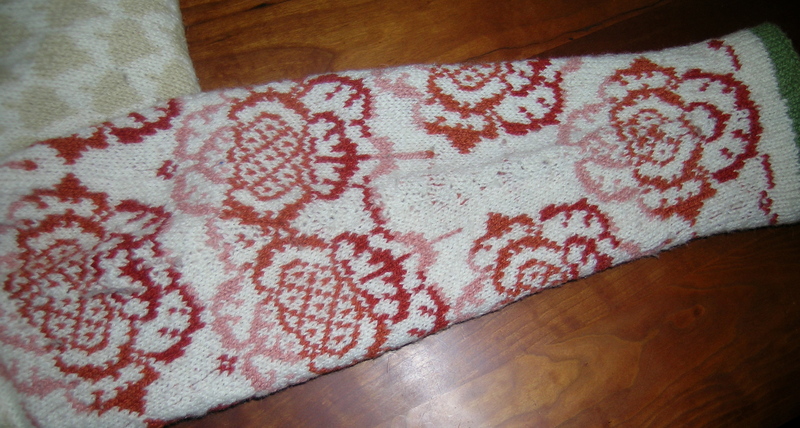 This photo is of the Peony Cardigan from the same book. On first glance, the sleeve undersides (where the increase are) looks fine, but it was a juggling act to get them to work properly. By the way, I made this sweater when the pattern was first published in Interweave Knits. I fell in love immediately, and ordered the kit to have the proper yarn and colors. I think that this was my second Fair Isle project. When I saw the book a couple of years later, I snatched it up immediately, even though money was very tight, as I love, love, love, Solveig Hisdal’s patterns and use of color.